You know how Amazon has that “look inside” feature that lets you preview the content of a book? Often, when I’m considering a cookbook by an author that I’m not familiar with and this feature is available, I’ll page through to get a sense of what their recipes are like and whether I might actually like them. Then, sometimes, if I come across a recipe that looks particularly good, I’ll take a screenshot of it so I can make it later. Is that bad? It feels sort of naughty every time I do it. I mean, they’re making the content available so it should be okay, right? And, in all fairness, if I try the recipe and like it, I’ll usually buy the book. I guess there’s just something about saving it that feels a little dirty. P.P.S. I also have a recipe for you. The recipe I’m sharing today is an adaptation of one that I grabbed while virtually browsing Everyday Raw Detox by Meredith Baird and Matthew Kenney : Chia and Buckwheat Cereal. Since I always have the ingredients on hand, it has become a favorite, quick breakfast staple for me. It’s also easy to customize depending on what sounds good that morning. You know what pretty much always sounds good in the fall? Pumpkin. And apples. The combination results in a cold cereal that can actually be called substantial. 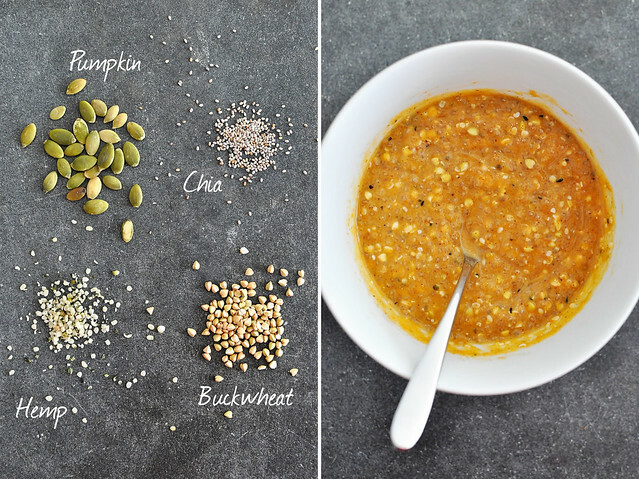 It’s thick and a little creamy from the chia and almond butter, has a good amount of crunch from the buckwheat and pumpkin seeds, plus you’re getting a dose of both fruit and veg in your breakfast bowl. With a little bit of cinnamon and nutmeg, the flavor is distinctly fall and definitely delicious. Since the chia takes several minutes to gel, mix the seeds and water first thing in the morning. Then go take a shower or get a pot of coffee going to kill some time. This hearty, healthy bowl of seeds and fruit is worth the wait. Place the chia seeds, buckwheat groats, and hemp seeds in a cereal bowl. Add water and stir to combine. Set aside for 15-20 minutes, until the chia seeds form a gel and the mixture becomes thick. Add the almond butter and stir until fully incorporated. Stir in the maple syrup, pumpkin puree, cinnamon, and nutmeg. Fold in the diced apple (reserve a small amount of apple for garnish, if desired). 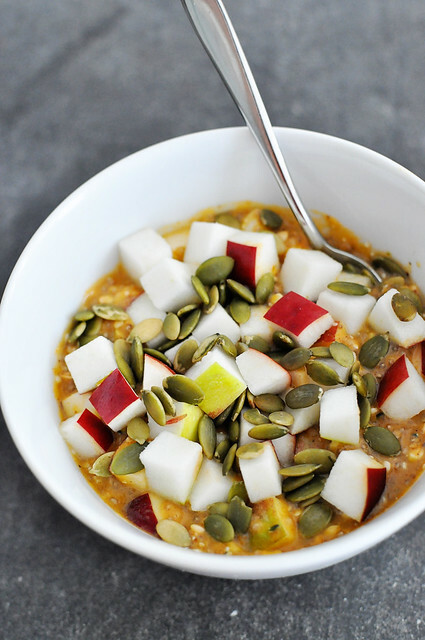 Top cereal with reserved apple and pumpkin seeds. Nut-Free Option: Use a seed-based butter, like sunflower, or omit the almond butter and use a nut-free plant milk in place of the water. I see no shame in looking through the preview. I swear, there are so many recipes that float online, with permission, it is mind boggling how authors can make a living. I still can’t get over how white your apples are. Are they Ida Reds? I find they are usually the brightest inside. I am with you re: recipes floating everywhere. The one I that I used as a springboard for this recipe is all over the internet. Crazytown. I’m pretty sure these were Cortlandt apples. I was surprised by how white they were too–they made our Honeycrisps look super yellow by comparison!